In the range of generally available fuzz boxes covering a scale from 1 through 10 , this one goes to 15 ! Specifically designed to simulate “Imminent Amp Death” this custom built unit features several separate stages so that the user may tune it to his or her own degree of ‘I.A.D.’. The first stage is a Linear DRIVE with up to +26dB of gain feeding the second stage; a stabilized “Germanium” preamp which overloads smoothly when overdriven. 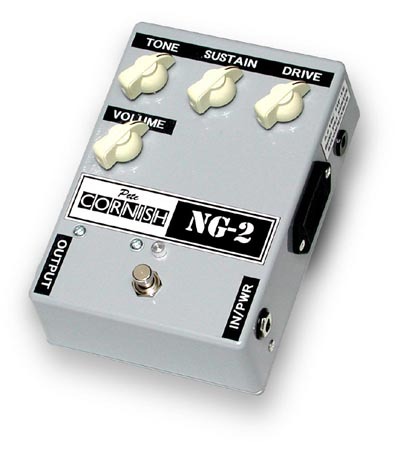 The third stage is where the NG magic takes place; it simulates a tube amp that has been over biased or has suffered serious tube or output transformer failure (The sound just before the fuse blows). The SUSTAIN control adjusts the signal level into the third section and can be adjusted from ‘Tired Output Tubes’ to ‘Melted Tubes and Shorted Output Transformer’. TONE and VOLUME controls complete the ensemble to allow matching to your bypassed signal. To glory in the sound of this pedal feed it into an amp capable of delivering huge amounts of clean, pure tone into your speakers. RFI rejecting input and bypass buffer. Housed in a Rugged Die-cast box with ‘Chicken-Head’ pointer knobs. Heavy Duty Custom made all-metal footswitch with Hi-Brite LED. Easy battery replacement via ‘drawer’. The battery is switched on when you insert the “INPUT / PWR ON” jack and to ensure long battery life unplug this lead when the unit is not in use. If the unit is not to be used for a long length of time we recommend that you remove the battery. Preferred battery type is MN1604. Also fitted is an input for a DC adaptor: the size of the connector is M2.1 and the tip is negative (-VE). The voltage rating of the adaptor should be fully stabilized at 9.6V and capable of supplying 20mA. We recommend the use of the BOSS PSA series adaptors (PSA-100/110/220 or 240 depending on your local AC supply voltage) as meeting the above criteria and cannot accept any liability for damage caused to this unit by the use of any other type of AC/DC adaptor. This unit has been built using the finest available components and constructed to the highest standards but should any fault occur during the twelve months from date of purchase please return it post paid to the above address where under guarantee repairs of any original manufacturing fault will be carried out (normal wear, misuse, unauthorized modifications or accidental damage excepted). The warranty will be voided if the guarantee labels are damaged or removed. This warranty does not apply to customer’s own equipment, which has been connected to this unit. ©Pete Cornish™ Partnership 2018. E. & O.E.